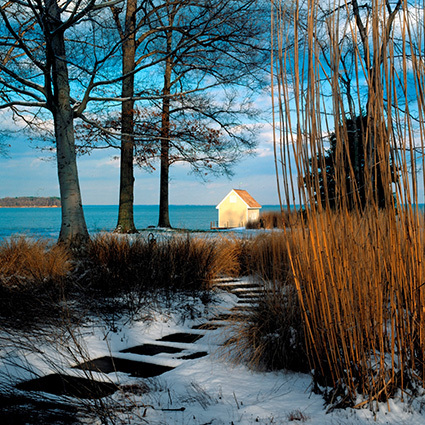 The first exhibition at Nassau County Museum of Art's brand new space, The Manes Family Art & Education Center, will be TCLF's traveling exhibition The New American Garden - The Landscape Architecture of Oehme van Sweden. 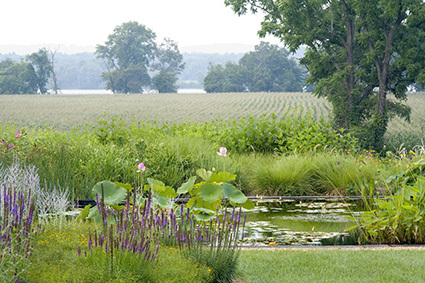 Wolfgang Oehme (1930-2011) and James van Sweden (1935-2013) revolutionized landscape architecture with their “New American Garden” design style, which featured great profusions of grasses, bulbs and perennials in sweeps of texture, form and color that had year-round appeal. This traveling photographic exhibition debuted at the National Building Museum in Washington, D.C. on October 17, 2015 and was the largest monographic exhibition in the museum's history; it includes 52 contemporary and newly commissioned photographs of important residential, civic, and commercial projects. The exhibition's creation was timed to the 25th anniversary of the influential 1990 book Bold Romantic Gardens, which the two business partners wrote with Susan Rademacher, former executive director of the Louisville Olmsted Parks Conservancy, Inc., and currently the parks curator at the Pittsburgh Parks Conservancy, and chronicled 21 projects that introduced the world to their horticulturally exuberant designs. The exhibition will be on view at the University of Virginia, Campbell Hall Architecture School, Elmaleh Gallery. Oehme and van Sweden created their eponymous, Washington, D.C.-based firm in 1975 and quickly gained critical attention and praise for their work at the Federal Reserve Board Gardens (Washington, D.C.), the first public iteration of their signature style, and at the Water Mill, New York home of Alex and Carole Rosenberg. Their style sharply contrasted with the archetypal lawn-centric landscapes that dominated Postwar America. As van Sweden said in a 2008 Washingtonian interview: “[Our designs] did not feature lawn but tapestry-like plantings and perennials and masses of the same plant—3,000 black-eyed Susans instead of six.” Plants were the dominant and signature feature of their work, and they created gardens to be interesting in all four seasons. The exhibition is divided into four sections:  significant early projects in Bold Romantic Gardens including the Rosenberg residence, the Slifka Beach House (Sagaponack, New York) and the Vollmer Garden (Baltimore, Maryland);  Residential Gardens, showing projects in Massachusetts, New York, South Carolina, Virginia, and elsewhere;  Civic and Commercial Gardens, including the Federal Reserve Board Garden, the national World War II Memorial, Chicago Botanic Garden, New York Botanical Garden, Forest Park (St. Louis, Missouri), Americana Manhasset (Manhasset, New York), and others; and  Legacy and Stewardship, focused on landscape architecture’s innate ephemerality (nine of the 21 gardens in Bold Romantic Gardens are lost), and challenges to extant projects, notably Pershing Park (Washington, D.C.), for which Oehme, van Sweden & Associates did the planting plan, and which could be demolished to make way for a national World War I Memorial. James van Sweden grew up in a large Dutch community in Grand Rapids, Michigan, earned a bachelor of architecture degree from the University of Michigan, and studied landscape architecture at Delft University of Technology in 1960. After three years in the Netherlands he returned to the U.S. Wolfgang Oehme, originally from Germany, studied landscape architecture at the University of Berlin, graduating in 1954. He moved to the U.S. in 1957 and worked for the Baltimore County Department of Parks and practiced independently before founding a partnership with James van Sweden in 1977. In many of the projects illustrated in the exhibition, Oehme and van Sweden worked with other practitioners, including the three principals of the successor firm, OEHME, VAN SWEDEN │OvS—Sheila Brady, Lisa Delplace and Eric Groft—who continue their legacy.